Discussing about jersey colours... have you seen the new kit of Stade Français ? an awful blend of khaki and pink that let me think that my favorite players are covered with mud and dust... I have opened a Facebook group to protest against it !! 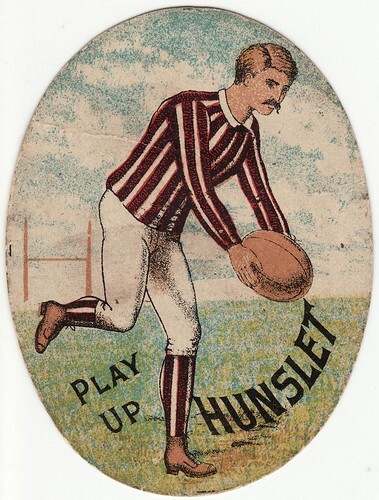 "Play up Hunslet"... a tribute to Jason Robinson and Albert Goldthorpe ! Disclaimer : I also like Rugby League ! 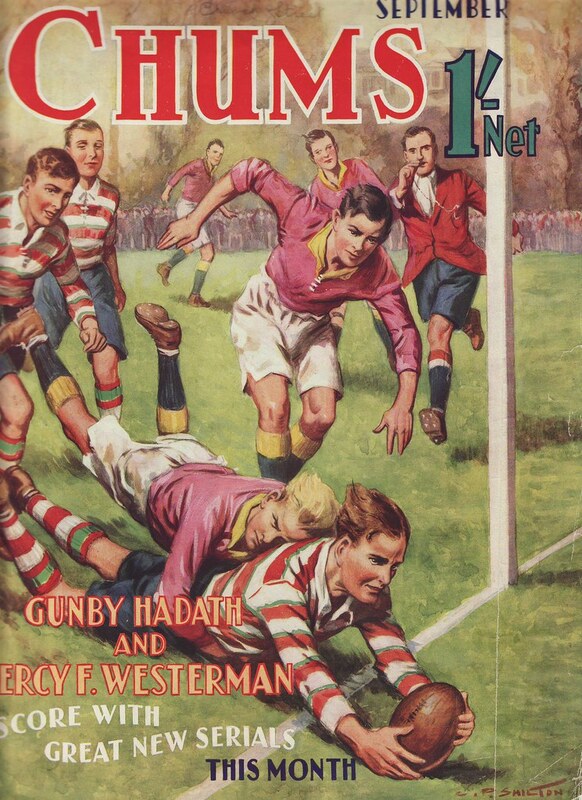 Hunslet, founded 1883, was one of the founding members of the Northern Union in 1895, then one of the sport's strongest clubs in its early years, becoming the first to win All Four Cups in 1907-1908. The gentlemen on my trade card could very well be Albert Goldthorpe, aka "Arh Albert" aka "the gentleman of Yorkshire football". Albert Goldthorpe made his debut as a 16 years old in October 1888. 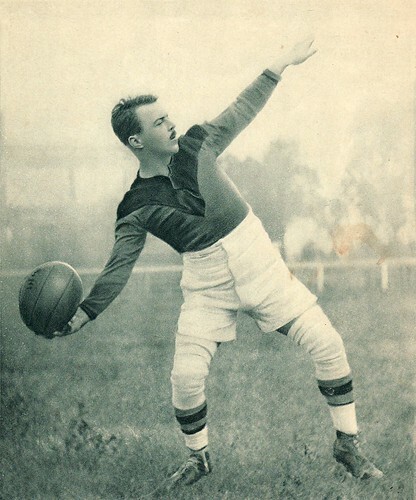 He is believed to have kicked nearly 1000 goals, including 14 from 15 attempts against Dudley Hill at Parkside. He is remembered by an older generation as a drop kick specialist and is credited with having dropped over 200 goals in his great career, 5 in one match. 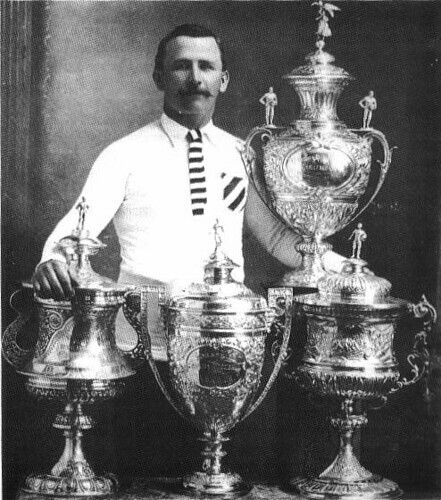 In his last full season in the game, the “All Four Cups” season, Albert then aged 36 played in 42 games, scored 5 tries and kicked a new Northern Union record of 101 goals. PS : can somebody help me to identify this trade card... it looks like a Baines card... but it's oval... and there is nothing written on the back... or could it have been cut out from a larger print ? 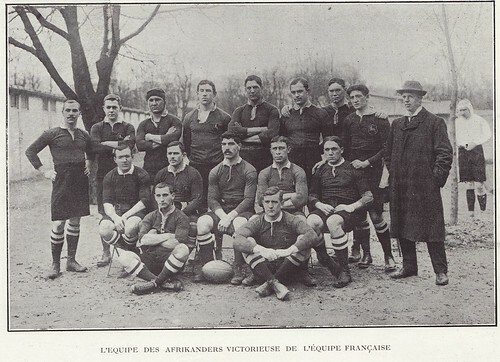 Springboks first victory in Paris... 100 years ago ! 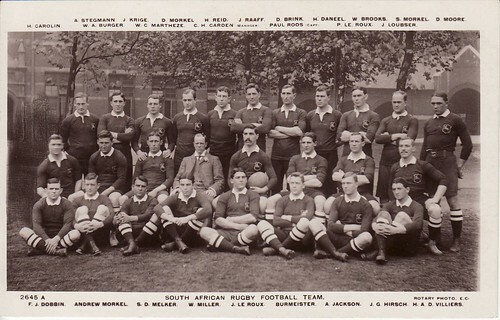 As a coincidence, we are celebrating in 2007 the 100th anniversary of the first visit of a South African team in Paris, as in January 1907 Paul Roos' Springboks made a stop over in Paris on their way back home after their fantastic tour in Great Britain end 1906. 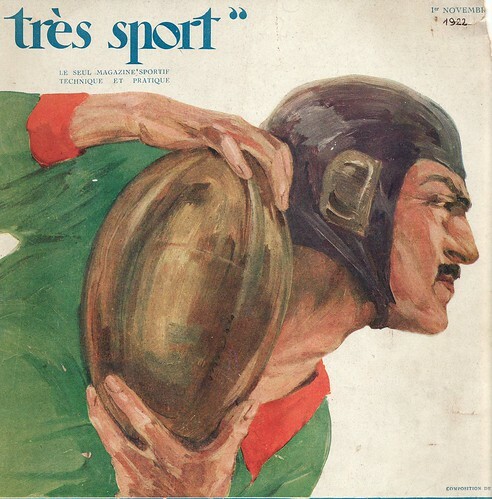 This picture is the cover page of French sports weekly magazine "La Vie Au Grand Air", January 1907, showing Boks' captain Roos holding the ball for his kicker Morkel. Paris public transports are on strike today.. I hope that it will discourage a lot of bidders to attend to this sale ! Sometimes, old postcards can reveal strange stories... 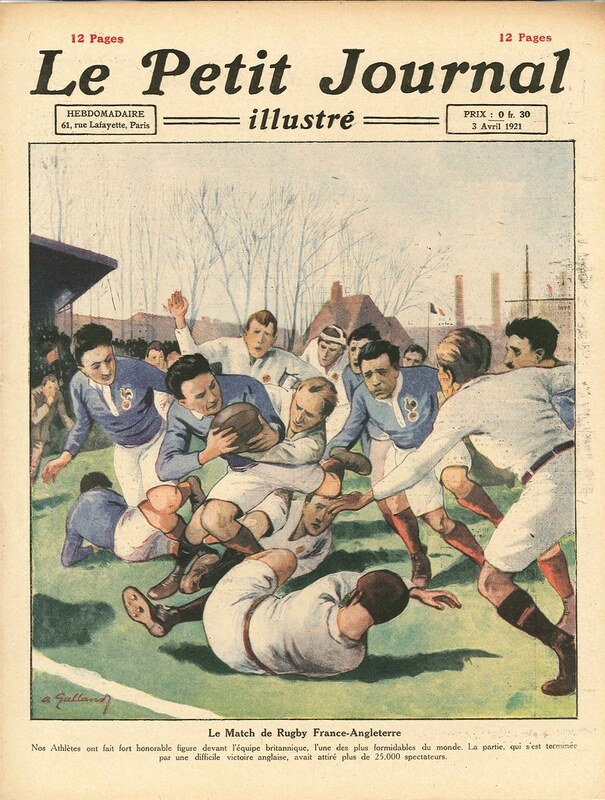 I had never imagined that rugby had been played in French colonial Vietnam before WW1... 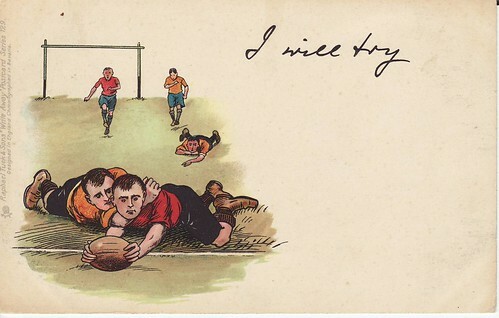 This postcard, sent to France by one of the players, describes a game played in Hanoï in 1909, but the the teams remain unidentified. 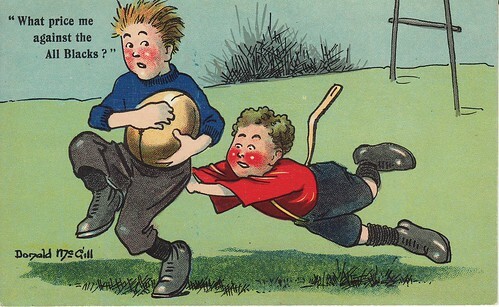 During the past two days, I have met a lot of wonderful fellows from the "rugby history" community... but I will detail that later... 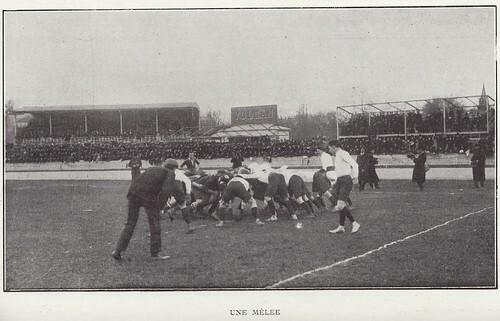 I am just rushing to the Stade de France to support France vs England... "Allons enfants de la patrie" !! 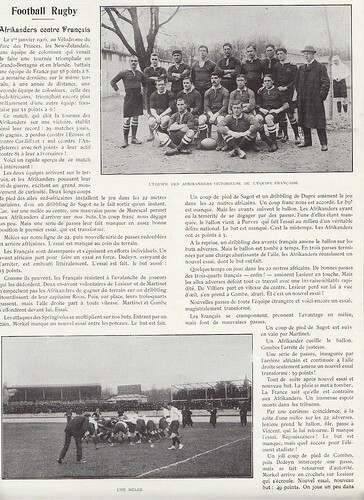 Celebrating 100 years of "Les Bleus"... and a quizz! 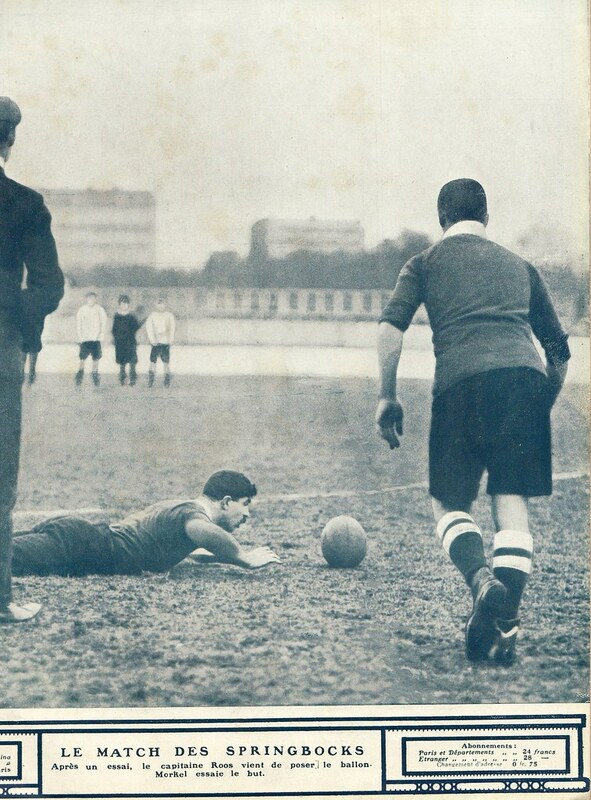 So... French blue jerseys were first introduced in January 1907 to play England in Richmond, i.e. 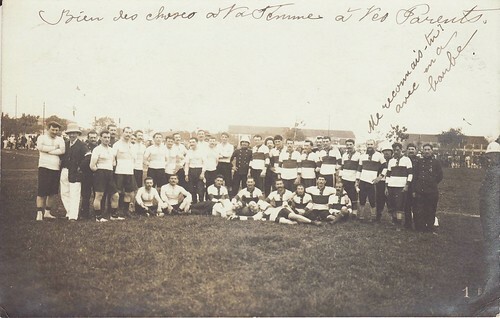 the second ever meeting of the two countries and the first in Enland - with the home side winning 41 -13. 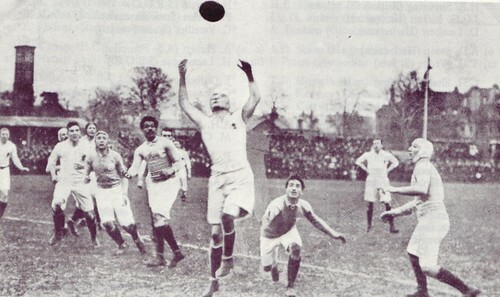 French players on the image were (from left to right) Mauriat, Vergès, Lacassagne and Muhr. And now, a quizz ! 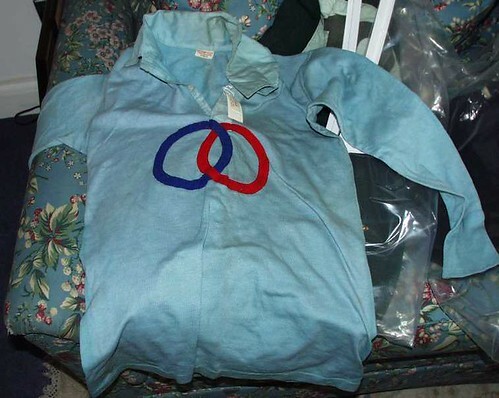 Simon droped me a mail some days ago asking for assistance to identify this jersey... and I must admit that I don't know (that's why I was searching among old French rugby jerseys...). Could somebody help ? France and England made it ! "Special bonus" : two vids from New Zealand... from the talented guys @ "Alternative Rugby Commentary"... the first video "the Periodic Tables" is a teaser for RWC Quarter-Finals... the other one "The French Test" was introducing French tour in NZ last June... hilarious !